Over-accessorizing is a common problem a lot of guys fall prey to. While we definitely believe the right accessories can really elevate your look, it’s important to know how to do it right. In this episode of 2 Minute Tuesday we’re answering a viewer question about rings. Should a man wear them? If so, how many are too many? Stick to this rule as the be-all, end-all of ring rules. Any more than that and you’re going to look like you are trying too hard. Thumb rings are a definite no-go, they just come off as tacky and cheesy. Keep your rings to your forefinger, middle finger, and maybe your pinky. We’re not diehards about not mixing metal types with rings and watches, but it does look best if your rings are somewhat consistent with your watch or other accessories. In addition to proper cleaning and washing, keeping your clothing in good shape and looking great has as much to do with how you store your garments it as it does with how you wear them. Proper storage is also key to extending the life of your clothes, whether it be investment purchases like a leather jacket or a suit or something as simple as a t-shirt. 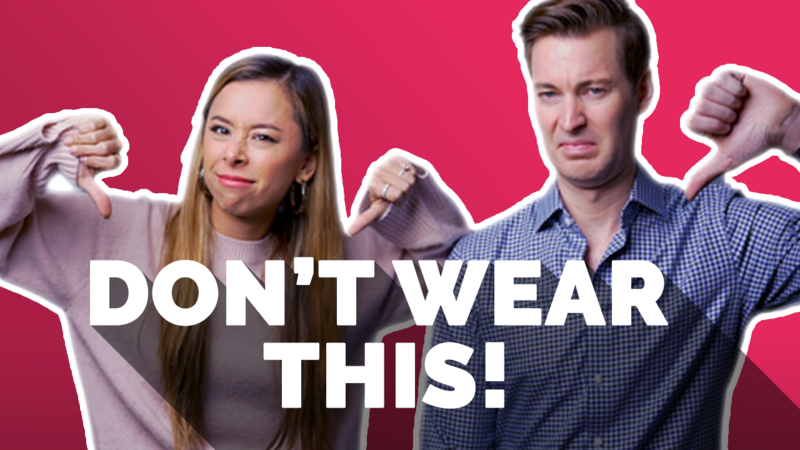 So, in this episode of 2 Minute Tuesday we’re answering a viewer question about how to properly store your clothing and all the tools you need to outfit your closet. They help maintain clothes and keeps them organized. We recommend jacket hanger for all types of jackets, from suits to bomber jackets. The shape helps support the jacket’s shoulders and structure. We recommend clip hangers for any and all pants and felt hangers for all types of shirts and sweatshirts. Hanging your pants vertically with a clip hanger is the ideal way since it will help hang out wrinkles. Simply attach the clip to the bottom hem of your pants and then hang. But, folded over once on a proper hanger works if you’re limited on closet space. You never want to hang your sweaters as it can damage the delicate material. Fold them and store them in a drawer or in the closet and don’t forget cedar blocks for keeping moths away. Organization and storage are two things that a lot of guys often overlook when it comes to thinking about their wardrobe. Let’s face it, your clothes spend most of their life in your closet and in drawers rather than on your body so it makes sense to give their storage some thought. Plus, how you store them is going to have a huge effect on their life as well. We’re not suggesting a Patrick Bateman OCD level of color coordinating but, in terms of getting dressed, having a well-organized closet is only going to help you make better, quicker decisions when you’re getting ready. We’ve got all our favorite picks below, make sure to check them out. They help maintain clothes and keeps them organized. We recommend felt hangers for shirts and pants and suit/jacket hangers for, well, suits and jackets. The extra width and structure help keep the shoulders of your jackets in good shape. A critical yet very inexpensive item that helps shoes keep their shape and prevents creasing and wear. One of these makes getting shoes on a breeze and prevents smashing of the back of shoes which can add extra wear and tear. We recommend the longer ones because they’re so much easier to use. A must-have if you wear any dark clothing at all. Super important for long-term storage, these will protect suits and sweaters from dust, moths, and moisture. Hoodies, we’ve all got them, but how and when are the right ways for a stylish man to wear them? In this episode of 2 Minute Tuesday we dive into whether or not men should wear hoodies. Don’t forget to check out all of our hoodie picks below! No logos – You always hear me going on and on about no logos, and it’s for good reason! You’re not a billboard and large, garish logos aren’t something that adds anything stylish to a well-dressed man’s overall look. Solid colors only – Keep your color choices simple – grey, navy, black, olive, or dark grey. Stick with pullover hoodies – They’re a great layering piece as part of your casual wardrobe, especially with denim, chinos, and sneakers. Try Wool/Cashmere – Higher-end materials like cashmere can elevate the look of a hoodie and add a bit of extra something, especially if you’re wearing them in the evening. Are Smartwatches Stylish or Fashionable? In this week’s 2 Minute Tuesday, we’re talking about smartwatches. Now a pretty common men’s accessory, there are a bunch of different styles and brands. But, are they stylish? What’s the right way to wear them? Don’t forget to check out our in-depth guide about men’s watches for all of our watch style tips and picks. Only wear with casual and business casual – The look and style of a smartwatch is really only suited to your casual wardrobe. So, if you’re going to be dressing more formally in a suit or blazer look, opt for a more formal style of watch. Mix up your look – The interchangeable bands offer you a great opportunity to mix up the look and style of your smartwatch, so don’t be afraid to experiment with different colors and leathers. Many of you might be saying “I should dress for myself, not for women!” and while that’s true, putting thought and effort into how you dress and how you’ll be perceived by women (or anyone really!) is not only important, but it’s a fact of life. Thanks to our friends at The Tie Bar for sponsoring this video, we’re longtime fans of their dress shirts and their ties, they’re sure to help you look amazing! Keep It Simple – Don’t overdress for the occasion and try too hard (ie: wearing a suit when it’s the wrong occasion / too many logos/hyped trends). Simple looks from an Essential Wardrobe like dark denim and a blazer or bomber jacket or chinos and an oxford are great places to start. Put In Effort – Even though you want to keep it simple, that doesn’t mean you shouldn’t put in thought and care to your look. Fit Is Key – I repeat this all the time (because it’s important) but your clothes and look will be most attractive if they fit you properly and flatter your body type. Need some fit tips? Check out our Fit Guide, it’s all there! Presentation – Make sure your clothes aren’t wrinkled or dirty. It may seem obvious but taking a few extra minutes to properly iron/steam your outfit goes a LONG way. Dress For Confidence- Yes, I know this isn’t technically something you wear but in many ways, it’s just as important. Being confident and comfortable in your own skin is super attractive and will enhance your overall appeal and how you’re perceived. Feeling good about what you’re wearing goes a long way to helping you feel confident so it’s all intertwined. On this week’s 2 Minute Tuesday, we answer a viewer question from Luis about how to handle wardrobe challenges when you’re on the road to significant weight loss. Thanks to Luis for the question! If you’ve got a question for us, make sure to drop it in the video comments section! Look at wardrobe upgrades as a reward for your hard work. A always, getting the proper fit is key so make sure to check out our Fit Guide. Streamline your wardrobe. Keep things simple and affordable with our Essential Wardrobe. Invest once you’ve reached your stable weight. You’re an elder statesman now, it’s time to start looking like one. – Classy, poised, confident. Basically, you need to dress your age, but what that means is probably not what you’re thinking. In addition to cultivating a timeless Essential Wardrobe, here are some things to look out for and avoid as you cultivate your style as an older gentleman. Anything loose or baggy. Fit is key, so check out our Fit Guide! Anything that fits too tight. Clothes should hug your body, not strangle it. Sandals of all kinds unless you’re swimming or by a body of water. Leather jackets – biker, cafe racer – it’s way too mid-life crisis. Always opt for a classic suede bomber.